The Awards also include a revamped technology category and a new category designed to highlight issues contained in the UN Sustainable Development Goals. Each year, this Achievement in Sustainable Development category will centre on different SDGs or targets. For 2016, the focus will be on food security and health, two of the most important SDGs. The Transformational Business Awards are open to all financial and non-financial private sector organisations, with an emphasis on private sector-led public-private partnerships. For the second year, a special Excellence in City-led Transformation Category, supported by Cities Alliance, will also underline achievements by municipal governments around the world. The 2015 Awards attracted 191 entries from 167 organisations, involving projects in 140 countries. 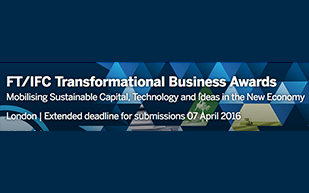 The deadline for entries is 07 April 2016. The winners in each category will be announced at a special dinner in London on 9 June 2016. The dinner will be preceded by the FT/IFC Transformational Business Conference, a major gathering of thought leaders who will explore and debate the issues generated by the Awards. The 2016 Transformational Business Awards mark more than a decade of collaboration between the Financial Times and IFC on global awards initiatives that have had a significant impact on the way financial and non-financial institutions approach sustainable investment. These initiatives began in 2006 with the FT/IFC Sustainable Banking Awards, which evolved into the Sustainable Finance Awards in 2011 and the Transformational Business Awards in 2014.